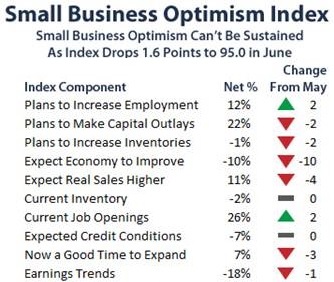 After a promising 3 month run, June’s Optimism Index fell 1.6 points to 95.0. While job components improved, capital outlays and planned spending faded along with expectations for improving business conditions. Overall only two Index components improved, two were unchanged, and six fell. http://www.nfib.com/assets/optimism-components-nfib-201407.jpg• Labor Markets. NFIB owners increased employment by an average of 0.05 workers per firm in June (seasonally adjusted), the ninth positive month in a row and the best string of gains since 2006. Seasonally adjusted, 12 percent of the owners (up 1 point) reported adding an average of 3.3 workers per firm over the past few months. The remaining 75 percent of owners made no net change in employment. Fifty-three percent of the owners hired or tried to hire in the last three months and 43 percent (81 percent of those trying to hire or hiring) reported few or no qualified applicants for open positions. Twenty-six percent of all owners reported job openings they could not easily fill in the current period (up 2 points), suggesting more downward pressure on the unemployment rate. Fourteen percent reported using temporary workers, unchanged for several months. • Job Creation. Job creation plans continued to strengthen and rose 2 percentage points to a seasonally adjusted net 12 percent, approaching “normal” levels for a growing economy (even with no growth last quarter) and the best reading since 2007. Not seasonally adjusted, 18 percent plan to increase employment at their firm (down 3 points), and 5 percent plan reductions. • Sales. The net percent of all owners (seasonally adjusted) reporting higher nominal sales in the past 3 months compared to the prior 3 months fell 1 point to a net negative 2 percent. This is among the best seasonally adjusted readings since early 2012 when the economy temporarily reached a more normal growth rate. Thirteen percent cite weak sales as their top business problem, one of the lowest readings since December 2007, the peak of the expansion. Expected real sales volumes posted a 4 point decline, falling to a net 11 percent of owners expecting gains. Unadjusted, 38 percent expected higher real sales volumes in the next three months, while 20 percent expected reductions. Lower expected sales volumes offers no motivation for owners to hire or order more inventories. • Earnings and Wages. Earnings trends deteriorated 1 point to a net negative 18 percent (net percent reporting quarter to quarter earnings trending higher or lower), still one of the best readings since 2007. Rising labor costs are keeping pressure on earnings, but there appears to be an improvement in profit trends in place, even if not historically strong. This is one of the best readings since mid-2007 with the exception of a few months in early 2012 when the economy posted decent growth rates for several quarters. Two percent reported reduced worker compensation and 24 percent reported raising compensation, yielding a seasonally adjusted net 21 percent reporting higher worker compensation, up 1 point and among the best readings since 2008. A net seasonally adjusted 13 percent plan to raise compensation in the coming months (down 2 points), still one of the strongest reading since 2008. The reported gains in compensation are now solidly in the range typical of an economy with solid growth. • Credit Markets. Six percent of the owners reported that all their credit needs were not met, up 1 point and 2 points above the record low. Twenty-seven percent reported all credit needs met, and a record 54 percent explicitly said they did not want a loan (67 percent including those who did not answer the question, presumably uninterested in borrowing as well). Only 3 percent reported that financing was their top business problem compared to 22 percent citing taxes, 20 percent citing regulations and red tape and 13 percent citing weak sales. The pace of inventory reduction was steady, with a net negative 4 percent of all owners reporting growth in inventories (seasonally adjusted). The net percent of owners viewing current inventory stocks as “too low” was unchanged at a net negative 2 percent, still a “lean” reading. Sales trends deteriorated a bit but remained at the best levels in the recovery, just historically weak. Expected real sales weakened as well, and this contributed to less urgency to rebuild stocks. The net percent of owners planning to add to inventory stocks fell 2 points to a net negative 1 percent. While inventories have been building solidly at the national level (a car inventory bubble), it appears that the small business sector is adding only a little to the accumulation of stocks reported in the GDP accounts and sales are too weak to produce much liquidation. • Inflation. Ten percent of the NFIB owners reported reducing their average selling prices in the past 3 months (up 2 points), and 23 percent reported price increases (down 2 points). Seasonally adjusted, the net percent of owners raising selling prices was 14 percent, up 2 points from May and 15 percentage points from December. Twenty-two percent plan on raising average prices in the next few months (unchanged). Only 3 percent plan reductions (up 1 point), far fewer than actually reported reductions in past prices. Seasonally adjusted, a net 21 percent plan price hikes (unchanged and the fourth highest level since 2008). If successful, the economy will see a bit more “inflation” as the price indices seem to be suggesting.